Choosing a veterinarian is one of the most important decisions that you make as a pet owner. At Ambassador Animal Hospital, our patients and clients are at the center of all we do. We practice veterinary medicine because we are dedicated to helping pets live long and happy lives. We know your pet is a very important member of your family and deserves the best care possible, and we'll treat your pet as one of our own. 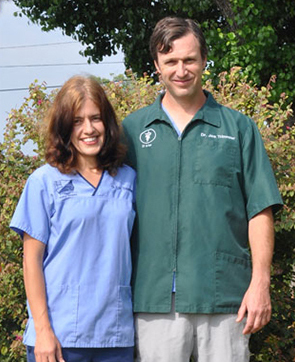 Ambassador Animal Hospital was founded by Dr. Robert Edwards in 1961 as a small, one-veterinarian practice. In 1971, Dr. Edwards relocated the practice to its current home on Forest Drive. He continued to practice veterinary medicine until his retirement in 2001, when he sold the practice to Drs. Joe and Erin Trimmier. To best meet the needs of our clients and patients, our three veterinarians still maintain a close-knit medical team with a strong emphasis on communication and a focus on giving every pet the personal attention they deserve. Your pet's long-term health and well-being begins with regular Columbia, SC pet wellness care that includes a comprehensive "nose-to-tail" examination, vaccinations, and preventive treatments. Identifying issues before they become serious is both the key to long-term good health and to keeping the lifetime cost of caring for your pet as low as possible. If your pet does become sick or injured, we are here to provide the compassionate, skilled veterinary care your pet needs and you want. Our pet diagnostic and surgical capabilities and in-house laboratory mean that we can work quickly to get you an accurate diagnosis and treatment recommendation and minimize both your pet's discomfort and your worry. When you bring your pet in to see us, we want you to feel confident your pet is receiving the best care possible. Ask us anything you want to know. The veterinarians and staff at Ambassador Veterinary Hospital know that great veterinary care begins with taking the time to get to know your pet and talking with you. It is important for us to take the time to get to know you and your pet: it is a relationship that we hope will last for many years. Our commitment to you and your pet doesn't end when you leave our hospital. We make sure you have the knowledge you need to provide the best possible care for your pet at home. We are also happy to help you get your pet in and out of our veterinary clinic, whether that means helping them from the car to our building, or using our pick-up and drop-off service. Home visits are available as well. 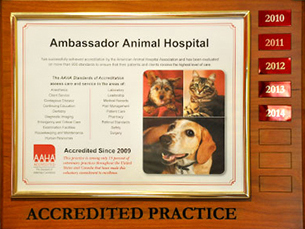 Ambassador Animal Hospital is an accredited member of the American Animal Hospital Association (AAHA). AAHA is the world's leading association of companion animal practitioners. To achieve AAHA certification, our hospital has passed comprehensive inspections of our facility and maintains strict standards that exceed the AAHA's requirements. Only a small percentage of veterinary hospitals in the country achieve this designation. When your pet comes to an AAHA-certified practice, you can rest assured knowing your companion will receive the highest-quality veterinary care. Our AAHA accreditation is another example of our commitment to your pet's health. Please take some time to learn about the services we provide and about why you should trust us with your pet's health, now and for years to come. If you have any questions or would like to schedule an appointment, please email or call (803) 787-3840. We look forward to meeting you and your cherished companion.